Read our Google Reviews and leave us a new review while you're there! You can like us on Facebook by clicking the Like Us at the top of the feed to your right. Or review us on any of your favorite review platforms! Cherrie, At such a sad time in my life, I was so thankful in meeting you! I dreaded thinking of my husbands funeral, his flowers, etc. 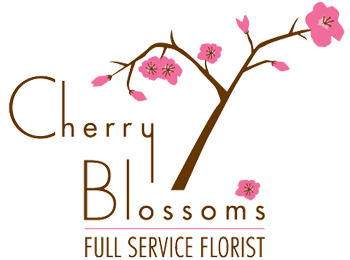 Walking into your Cherry Blossom Florist I could see the love you have in your business. You helped me through a difficult task and the flowers we chose, were so beautiful!! Just like everything in your florist! Thank you so much for all your care, not only in your flowers but also your customers! Thank you very much. My inlaws called last night to describe the arrangement and tell us how beautiful it is! Cherry Blossom never disappoints!!! Thank you so much for the beautiful arrangement you created for Cameron. The one for me was a wonderful surprise! Thank you for the smile you sent, it made my day! You are wonderful, thoughtful, and caring. That's why you are so successful!!!! Bless you all! The Hoffmeister family loved the flower basket you put together in memory of Mary. They said she would have loved it. High praise indeed. It was so nice to be able to call long distance and know that all would be taken care of with taste, quality and beauty. Thank you so much. We'll continue to call you for any Denver orders in the future. Once again I would like to say Thank You for your outstanding service and quality. The Bamboo you chose was beautiful! I want you all to know just how much we appreciate your professionalism when ordering, your superior quality of flowers and arrangements and as always the best price in town! THANKS! YOUR’RE THE BEST! Thanks VERY Much! My Mom always loves your arrangements! Excellent! You are more than welcome! I almost feel like you are responsible in part for my new found love!!! You helped me make my point!!! I am forever grateful!! I called the shop on Saturday afternoon, but Katie said you had left. I wanted to let you know that everything was fabulous. Thanks so much. I heard nothing but great compliments on how gorgeous the flowers all were. Will share pictures when I'm able. I know Jenn was very very pleased. The flowers, bouquets, bouts & wristlets were so beautiful! I have one of the spraybars on my dining table. Thank you so much for using your artistry and creativity on our behalf. what I found about your service that works for me. WOW!! The flowers that you sent to all of us are spectacularly beautiful!! I think this day meant more to all of us than anyone could have imagined. You have left us speechless with your generosity and kindness. Thank you again so much...we will share the flowers and put them on a rotating tour at each of our desks. Hello my name is Angela and I have just received my second flower arrangement delivered from your shop. I just wanted to say your arrangements are the best I have ever seen. Thank You. You and your team have done it again and I can't thank you enough! I just got a call from my wife and as I mentioned to you she LOVES the job you do. The first words out of her mouth were "You know how much I love Cherry Blossoms." She thought the arrangement was "Gorgeous" and "Perfect"!!!! Thank you very much for helping me make this a special day for my wife, the absolute love of my life. Last week I found your shop during an internet search for a florist in the Westminster area. I spoke to you and you promised to make up a ‘nice arrangement’ for my daughter and son-in-law. I just wanted to let you know that they think the arrangement is very beautiful and so much more than just ‘nice’! They were not home and so a neighbor took delivery of it first and she was very impressed and made note of your store for any future purchases she may need to make. I’m so glad I decided on your shop. Your service certainly did exceed my expectations and I appreciate it so much. The flowers were beautiful, and the timing for the delivery was perfect! It's a pleasure to do business with a company that fulfills their promises for quality service. I recommend you to all my business associates. Thank you so much.